Italy represents a very attractive Country for foreign investors who want to set up a company. This is due to the great success of the "made in Italy" products on the world market for many years. As a matter of fact, Italy is considered the eighth economic power in the world as well as the second manufacturing Country in Europe with an extraordinary know-how in strategic sectors such as machinery and automation, fashion and design. In Italy, there are centers of research and development of excellence and more than 20 Italian universities which are ranked among the 500 best in the world. The quality of life that Italy can offer, with its landscapes, art, history, culture and cuisine, has no equal in the world. Given this, most investors are Russians and Chinese who decide to invest and to set up new companies in Italy having as a guarantee high standards of profitability, stability and good return on investment. Despite this, the procedure to establishing a new company in Italy provides a whole set of complex legal obligations. The procedure of setting up a new company in Italy begins with the registration of the same at the institutional body called "Chamber of Commerce". Some facilities such as subsidised loans and state concessions are granted to the Chinese investors who want to set up a new company in Italy as well as the simplified procedure initiated by the Italian Embassy in Beijing for the issuance of entry visas for elective residence and long-term tourist visas (5 years) for all Chinese investors, lovers of the Bel Paese, who decide to purchase properties in Italy. - stay abroad: verify the principle of reciprocity. There is reciprocity when a foreign Country recognises to an Italian citizen an equal or similar right to that recognised to a citizen of that Country in Italy. - reside in Italy (if he is already resident or he is thinking to move): verification of the condition of reciprocity and possession of a valid residence permit issued to work as a self-employed, subordinate employment, waiting for employment, family reasons, humanitarian reasons or political asylum. - obtain from the relevant authority a document which attests that there is no impediment to the granting of the authorisation / license for carrying out the business activity. Non-EU citizens with an EC residence permit for long-term residents may carry out any self-employed activity in Italy. - the establishment of a subsidiary, that is a company or an entity with legal autonomy. Secondary office with permanent establishment refers to cases in which an organization is subject to the economic and administrative coordination of a foreign enterprise but it is has a degree of autonomy at a both management and operational level and it is also entitled to act on behalf of the foreign company on an ongoing basis through a stable organization aimed at running the business . The secondary establishment of a company set up abroad is subject to the provisions of Italian law on the recording of social acts, therefore, the same, will have to register on the Company Register. In addition to this, the foreign company will be required to provide the personal information of the individuals who represent it permanently in Italy and to deposit the articles of association and the financial statements. The opening of a representative office is the easiest measure to adopt in order to penetrate the Italian market. As a matter of fact, this measure allows to carry on the promotion directly in the territory, with low costs of incorporation and management and without being subject, unlike the other ways outlined, to the tax liability in Italy. The representative office is a simple cost center (fully deductible for the parent company) that does not generate any income, since it is not classified as permanent establishment. This implies that the foreign company is not obliged to deposit the article of incorporation and the financial statements. However, the obligation to register on the Company Register still remains. The third course available to a foreign subject who want to expand his business on the Italian market is to proceed with the creation of a company. In such a case, it is is necessary to proceed with the verification of the existence of the so-called reciprocity principle before any other assessment. The Ministry of Foreign Affairs of Italy shall verify the existence of the reciprocity condition. For all Chinese citizens, the condition of reciprocity is certain and it has already been verified by virtue of the bilateral treaty of 28 January 1985 (between Italy and the People's Republic of China) and therefore they can carry out corporate transactions with the following limits. 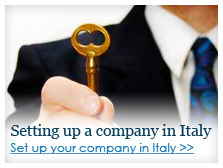 First of all, foreign investors who decide to open a new company in Italy have to choose the form of company to set up. - the s.r.l. (limited liability company), whose minimum capital is 10,000 euros, and in which the presence of a supervisory body is subject to the overcoming of certain dimensional limits. it is necessary to define the content of the agreements between the shareholders, which will regulate the legal functioning of the company, as a priority in case the entrepreneur decides to set up an s.r.l. Then it shall be also drafted the articles of association, fulfilled a series of bureaucratic obligations and require any documents and certificates which are necessary for the establishment of the new company in Italy. First of all, it is necessary to proceed with the allocation of an Italian tax code to the legal representative of the foreign company and then also to the foreign company itself. Since the Italian bureaucracy is particularly complex, generally foreign investors prefer to appoint an Italian professional attorney, by means of a power of attorney duly translated and legalized, who will entrust him to accomplish on behalf of the foreigner legal representative all the bureaucratic obligations which are necessary for the opening of a company in Italy . If you need to receive any assistance on how to set up a company in Italy, please contact us.